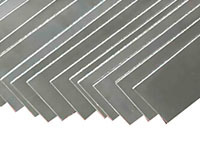 Stanford Advanced Materials (SAM) is a trusted supplier of zirconium strip. We provide a wide range of zirconium metal products with competitive price. Related products: Zirconium Tube, Zirconium Plate, Zirconium Wire, High Purity Zirconium Crystal Bar, etc. Zirconium (Zr) is a silvery metal with a density of 6.52 g/cm3. It has a very small neutron adsorption cross-section and relatively high melting point (1855 °C or 3371 °F), making zirconium a great material for nuclear power rods. In 1990s, about 90% of zirconium produced every year is consumed by nuclear industry. However, as more and more people get familiar with Zr and its compound, more applications has been found. Zirconium metal and Zirconium alloys has advantages in specialized chemical environments - primarily acetic and hydrochloric acids. The corrosion resistance of Zirconium comes from a tightly adhered oxide that forms almost instantaneously. As a result, zirconium has been used to make electrodes components, strips, flanges bolts, tubes and rods for special applications. Zirconium products also have wide applications in medical equipment, such as zirconium implants. 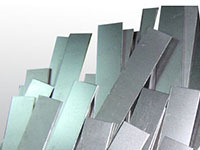 As Zirconium strips have better mechanical strength under high temperature, it is also used as support and structure components for high temperature applications. Multiple sizes are available for our zirconium ribbon and we do make customized products. - Used to make high temperature superconductive materials. - Used to make electrodes components, strips, flanges bolts, tubes and rods for special applications. - Zirconium alloys are also considered to be promising materials for commercial amorphous metal, also called metallic glass. Compared with common metal materials, amorphous metal has no grain boundaries, leading to better wear resistance and hardness. - Zirconium strip has wide applications in medical equipment, such as zirconium implants. Our Zirconium strip is carefully handled to prevent damage during storage and transportation and to preserve the quality of our product in its original condition.